If there’s one common theme at this year’s CES 2019 – the Las Vegas tech expo we’ve been covering all week – it’s talking. Not just chatting on the show floor (though there’s been plenty of that too). By talking we mean the sheer avalanche of devices arriving with support for Amazon Alexa, Google Assistant and so many other competing voice assistants. So is the remote control being killed-off? In the long-term, absolutely. It’s gone. “Getting rid of the remote control is one of the strongest use cases for voice technologies,” says Mark Lippett, CEO at XMOS, whose farfield voice tech is used in soundbars, Freebox and Skyworth TVs to allow them connect to Alexa. “Some companies are going straight to the far-field voice technology while others are using the near-field ‘push to talk’,” he adds. Ah yes, push to talk – AKA ‘the remote that refuses to die’. ‘Push to talk’ is when you have a remote in your hand and you hold it up to your mouth and speak into it while pressing a button. 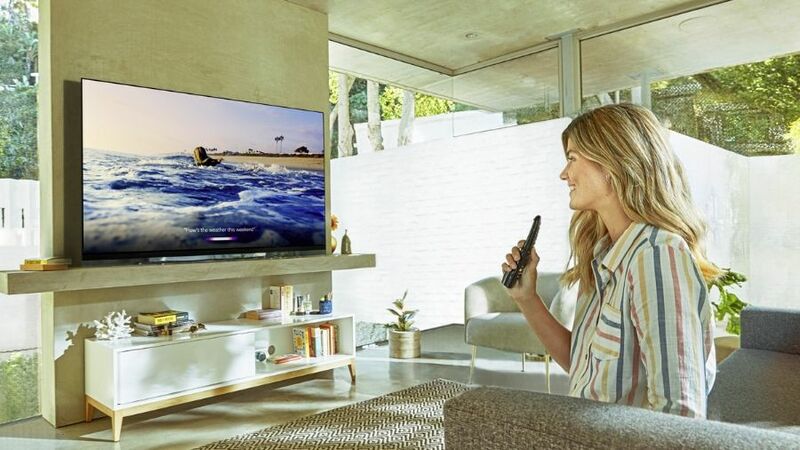 On Samsung’s QLED TVs for 2019, Bixby is accessed via a push-to-talk nunchuk-style remote, while Amazon Alexa or Google Assistant work only when used via an Amazon Echo or Google Home device. It’s a similar story for LG’s OLED TVs. It already feels quaint, and slightly confusing to use. Are there too many voice assistants? If we accept that voice assistants are the future, we’re still left with a situation where in the same room room you may be using Alexa on an Echo to play hands-free music, using Google Assistant, Alexa or Bixby to communicate with a TV, Cortana on an Xbox… and with more and more home-baked AIs appearing, the list is now endless. Will the tech industry need to coalesce around one voice platform? There’s no way the tech industry can continue forever with multiple voice assistants. “Our view is that they’ll be a broker, which you might regard as a kind of ‘digital twin’, ‘digital demon’ or Avatar that will provide your entry point to tens of thousands of different AIs that offer different services,” says Lippet, stressing that the broker would also protect the user’s privacy. However, tech announced at CES 2019 promises to make voice control – and many other kinds of control – far simpler. Some TVs and other appliances may now have far-field microphones that can detect a voice from across a large room, but in a world of multiple voice-controlled device, how can you talk to only one – or none – of them? Cue a radical new technology unveiled by XMOS and Holosonics at CES that can pinpoint the exact direction of an audio reply, then apply a narrow laser-like beam of sound in reply. The world’s first voice-activated personal assistant technology that creates sound with the same precision as light. Expect devices to use ‘multi-modal sensing’ in future, too. “A more intelligent device would be able to tell you were on the phone, and whether you’re trying to engage in a conversation with an appliance by using cue such as whether you’re looking at it or not – things that humans use in conversation, but these devices can’t,” says Lippet. Being able to separate different people’s voices will also become an important ability of future devices. Over in a suite at the Westgate Las Vegas Resort and Casino, a completely different kind of hands-free technology is being showcased from Norway’s Elliptic Labs, and looks ready to wipe-out the remote control entirely – using proximity sensors. The theory is that instead of pressing buttons or telling the TV what to do, it takes actions depending on your movements. For example, pausing a movie; in Elliptic Labs’ demo, video streaming from Netflix pauses when the proximity sensors detect you leaving the room to get another beer, and resumes when you return to the room. In another demo, you double-tap in the air to control the volume coming from a smart speaker. The tech is called ‘Inner Reflection’, and combines gesture recognition and presence detection using ultrasound. Used in a TV, it emits ultrasonic waves, which radiate from behind the screen to echo from the body of the user, essentially creating a 180-degree interaction space. Since it’s using audio, not the optical infrared beam typical of TV remote controls, the signal is less likely to be blocked. “If you’re listening to a show and you leave the room, you can have the volume automatically increased a bit so that you can keep following the show while you pick something up in another room,” says Guenael Strutt, VP of product development at Elliptic Labs. “Then, as you come back closer to the TV, you can have the volume adjusted lower again.” The same tech can also be used to shut-off the TV and lights if no-one is in the room for a period of time, and even detect if someone has a fall. A similar version of the tech is already used on the Xiaomi Mi MIX it’s all just a software update for any device with a speaker and microphone. “I don’t imagine that it will replace remotes completely, but it certainly provides the ability to control usage, volume and such – actions that today are associated with remote controls,” says Strutt. For now, it’s all about voice. “Voice interfaces will find their way into everything that requires human interaction from time to time – and that’s the majority of categories,” says Lippet. The XMOS/Holosonics tech promises to make the likes of Alexa much more personal and focused, with incoming AI set to make smart devices more aware of context. Then comes gestures and haptic feedback, though whether the remote will actively disappear remains to be seen. So instead of you looking around the room for the remote control, in future your TV is going to be looking for you.